The Democratic House schedule is already full. After they retake the lower chamber, Democrats plan to demand President Trump release his tax returns, and try to impeach him over the Russia probe. They have a few different avenues they can take for that latter goal, according to Rep. Jerrold Nadler (D-NY). 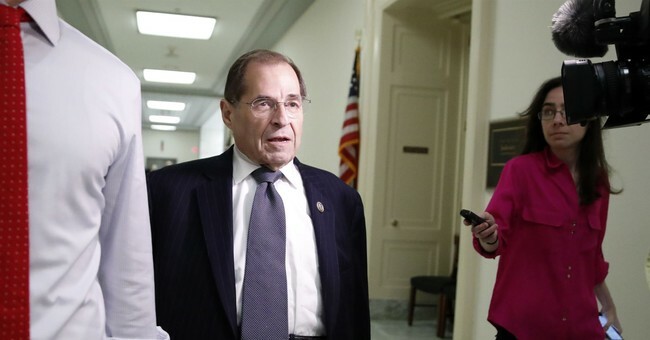 Nadler purports that Trump could be impeached for another issue: hush payments. Stormy Daniels and Karen McDougal allege to have had decades-old affairs with Trump and were reportedly paid to keep quiet in 2016. Trump has denied the relationships. Michael Cohen, who pled guilty to campaign finance violations over the payments, insists Trump directed him to shell out the money to the women. The president has denied that allegation. But, if it turns out to be very true, “that might very well be an impeachable offense,” according to Nadler. If it turns out the president was "procuring his office to corrupt means," Nadler told CNN, "that could be impeachable." The hush payments have been on Rep. Elijah Cummings (D-MD)'s radar. As current ranking member of the House Oversight Committee and expected to soon take over the panel, Cummings sent a letter to then-White House Counsel Don McGahn and the Trump Organization requesting documents related to Trump’s failure to disclose his debts to Cohen. It remains to be seen how seriously the Democrats will try to impeach Trump over these payments because they will already have their hands full with Russia. Top lawmakers are demanding the new acting Attorney General, Matthew Whitaker, recuse himself from the Mueller investigation and Nadler said they are expecting to see the final report. "We could subpoena the final report," he declared. "We could subpoena Mueller and ask him in front of the committee and ask him 'what was in your final report?'"